Since achieving the country's highest political office, Canada’s most recognized former libertarian, Stephen Harper, has at times revealed his libertarian origins. 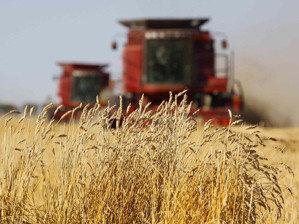 One recent example involves his government's commitment to end the marketing monopoly of the Canadian Wheat Board in order to allow farmers to market their produce independently. While some farmers welcomed the opportunity to freely market their produce, others opposed the free market approach, demanding that all farmers continue to be compelled by force of law to pool their wheat. The leadership of the Wheat Board took a bold stand that a government agency rarely ever undertakes, which is to use the courts to challenge their political bosses. There apparently was a statute in the Wheat Board Act that requires the government to hold a vote of all farmers in matters that pertain to the Board. They have won the challenge that stops the government from acting unilaterally to end their monopoly, compelling the government to hold a vote of all farmers. But a system of one farmer, one vote would in no way reflect the productive effort of each individual farmer. A farmer who has been a member of the Wheat Board for many years and produced one bushel of wheat per year for the past ten years will be allocated one vote. So will a farmer who has produced 10,000 bushels of wheat per year over the past 10 years. It is likely that farmers who are still members of the Wheat Board and who have produced no wheat over the past several years may also be allocated one vote each. The outcome of a vote may already be a forgone conclusion if based on a system that disregards the productive output of each farmer. Some 80% of the vote may represent about 20% of the productive output, allowing the less productive voters to dictate policy that governs their more productive counterparts. Under such a system, the farmers who produce less get to benefit from pooling their limited output with other farmers who produce much higher output. "When producers market their products, customers vote with their monetary units as to whose efforts they choose to support. In a voluntary market system, the most productive of producers garner the majority of the votes in the form of monetary units they receive from customers." An alternate method of voting would reflect the productive output of each individual farmer. A farmer who has produced an average of 10,000 bushels of wheat per year over the preceding 10 years would be allocated 10,000 points, perhaps denoted by a number on the ballot. Farmers who have produced one bushel of wheat per year over the previous 10 years would be allocated one point each. A vote that reflected the productive output of the producer would reflect the reality of an unregulated free market, which rewards producers based on their productive output. When producers market their products, customers vote with their monetary units as to whose efforts they choose to support. In a voluntary market system, the most productive of producers garner the majority of the votes in the form of monetary units they receive from customers. Such is the fairness of an unrestrained free market, and if our formerly libertarian Prime Minister chooses to put the farmers to a vote, a fair vote would reflect the productive effort of each voter over at least the past decade. Each farmer would have the right to vote according to the requirements of the Wheat Board Act, but the door would be wide open to include the productive output of each farmer in that vote. Under a voting system that includes both farmers and their productive output, those members of the Wheat Board who have produced nothing over the past 10 years will receive a ballot and their ballots will indicate zero production. The leadership of the Wheat Board may choose to challenge such an approach in the courts, that is, challenge the legitimacy of a vote in which each farmer gets to cast ballots based on one bushel, one point. When the points are added up, the final result will reflect the productive output of each farmer. The tabulated outcome of the points then might suggest that the majority of the productive output wishes to end the Wheat Board’s monopoly powers. In order to legitimize such a vote, the court may need to hear a libertarian defense of a voting system that reflected the productive output of each farmer. But after all, the vote is intended to decide what to do with that productive output.